Break the illusory effects of the library's magicka matrix. Rescue some scholars from an insidious spell. The Mages Guild hired dungeon-delvers and scholars to bolster their expedition force. A group of these treasure hunters are trapped in the Library of Dusk, including Kireth Vanos' brother, Raynor. 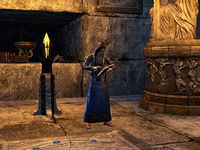 After sabotaging Daedric surveillance and unlocking the library, your work is not over as the scholars who entered the library seemed to have fallen under an enchantment which makes them want to stay despite the dangers. Kireth hasn't been effected yet and needs your help to rescue the others. Speak with her to find out her opinion on the nature of the spell and what you should do first to start freeing them. After you have read all of the available notes and are sure you remember the rooms' details, head down the stairs into the main part of the library. Raynor Vanos' chamber (Note the crystals and banner). When you enter the actual library, Kireth will already be down there, hiding by the archway away from the various Dusk Scholars (Battlemages, Chargers and Illusionists) that are wandering the halls. Either avoid or fight your way through them to the set of three rooms on the western side of the library, each room will be near identical, right down to a Raynor Vanos who is enthralled in a book. 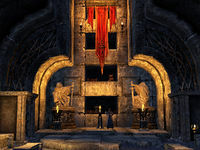 The only differences will be the color of the crystal lights and the which Daedric Princes' banner hangs on the walls. If you enter the wrong room and speak with the Raynor in there, he will proceed to mock you for being tricked and then drop the illusion—revealing themselves to be a Dusk Scholar who will then do their best to kill you. As mentioned in the observation notes and the table above, the correct room will have yellow crystals and banner showing the emblem of Hermaeus Mora, an eye. When you reach him, he will be reading a book and will quickly become snide with you as you talk to him. "Hmm? Oh, sorry. This book is so engrossing. Could we talk later?" "I said I'm reading. Go bother someone with an intellect closer to your own level. 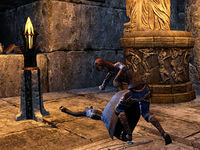 I'm sure Lady Clarisse and that Altmer artificer would be happy to listen to your inane ramblings." [Persuade] Look around. This isn't a normal library. It's affecting your mind. "I don't know what … wait! You're right. This place radiates Daedric magic. I can feel it in the back of my skull. We need to free the others! Do I need to go get your sister? "Whatever. Just go away so I can finish this interesting treatise on Dwemer displacement theories." If you decided not to or are unable to Persuade him with your words, you will need to bring in the big guns—his sister. Find Kireth at the archway and ask for her help. Kireth will then become your follower and you can lead her back to Raynor who will be back to his reading. Then just stand back and let Kireth work her magic. Once you have used blunt force trauma to break Raynor out of the spell, you can then speak with him to ask him what he knows. "I think so. I can still feel the spell tugging at my mind, though. Just in case, Kireth and I are going to our camp outside of the ruins. But I'm worried about the others. Since the spell doesn't seem to affect you, can you look for Lady Laurent?" "Thanks! Kireth and I will head for our camp outside the ruins. Meet us there after you find Lady Laurent and the artificer." Raynor will then leave with his sister and escape outside. Lady Laurent's chamber (Note crystals and banner). The next person to find is Lady Laurent, her chamber is on the south[verification needed — verfify] side of the library. Much like with Raynor, there will be three rooms which each contain a possible Lady Laurent and if you pick the wrong one that Dusk Scholar will try to kill you. 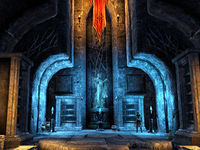 The room you will be looking for will have blue crystals and banners displaying the Cross of Meridia. Once you find the correct room, walk up to Lady Laurent and convince her. Unlike with Raynor, it will not take much effort to break her out of the spell. Lady Laurent will then leave the library to search for her manservant. Telenger the Artificer's chamber (Note crystals and banner). After freeing two scholars, you need to find the third. Fight your way to the east side[verification needed — verify] of library to the chambers where Telenger is being kept. The chamber you will need to find will have blue crystals and banners showing the Star of Azura, much like the previous times the wrong room contains a glamoured Dusk Scholar. But unlike the other times, when you enter the correct chamber, Telenger will be nowhere to be found. However, he did leave a note on a table to the side which he titled If You Can Read This, Open It. Take the the letter's advice and read it, in it Telenger will say that the magic in the library is very strong and that he has decided to lock himself in the vault downstairs in an attempt to buy time to come up with an escape plan. With these directions to Telenger head downstairs into the main shelving area, you may find a Ripped and Discarded Page which can shed some insight on things in the library's past. Then head down the northern passage to another room, the entrance to the vault will be on the eastern wall and you will be able to see Telenger watching through the bars. Talk to Telenger to see if the the library's spells have effected him yet. Enter the Library Vault Portal. After speaking with him, he will unlock the vault door. 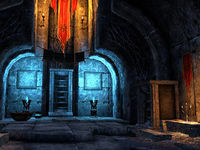 Interact with the door and enter the vault where Telenger will tell you about the portal and then ask you to enter it. As Telenger doesn't trust himself at the moment, he wants you to enter the portal and discover what the power source is. 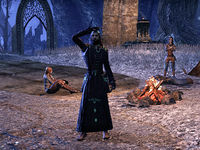 If it is indeed a Light of Meridia then its' recovery would make their disasterous expedition worth it. You will also be given Telenger's Teleportation Trajectory Token which should bring you back to the portal if you get lost. [verification needed — needs exact effects] With nothing else to do, you can enter the portal. Some unexpected assistance in the form of King Laloriaran Dynar. After entering the portal you will find yourself outside, high above the library and the surrounding landscape. 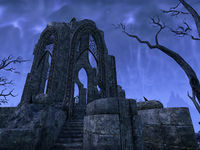 There will be one winding path heading upwards which leads to another floating island which houses some Ayleid ruins. Follow the path and enter the structure, inside will be one of the Lights of Meridia, contained in a metal frame. 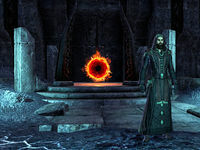 Once you have taken the Light of Meridia a spectral form will appear. After this, the projection of King Laloriaran Dynar will walk to the ledge while he offers some assistance. Projection of King Laloriaran Dynar: "Know that you may jump from here and rejoin your friends below. What power I still possess shall keep you safe." Once you take the leap, a bubble will form around you as you fall slowly. The path this bubble will take will be at an angle, meaning you will land near to the scholars' camp on the northern outskirts of the ruins. The rescued scholars take a break. When you reach the camp, everyone you rescued will already be there. While Raynor sleeps and Kireth and Lady Laurent walk around, Telenger will be on the look out for you. Speak with him and show him what you recovered. Telenger will then present you with some gold and the Dungeon-Delving Mantle. Afterwards, Cadwell will appear out of a portal, ready to ferry these people back to the Hollow City. After completing this quest, the Consultants' House in The Hollow City will unlock, and Kireth, Raynor, Clarisse, and Telenger may all be found there. Kireth is worried that there may be illusions or other spells at work in the library. She suggested that I examine the prisoner notes and look through the windows to determine where the Daedra are holding the scholars. Now that I've studied the holding cells and reviewed the prisoner notes, I'm ready to leave the gallery and enter the Library of Dusk. I should try to find Raynor Vanos first. I need to be on my guard, however, as Kireth thinks there may be illusions or other spells active in the library. I found the real Raynor Vanos. Now I need to convince him to leave the library. Raynor won't listen to me and I can't convince him to leave. Kireth told me to find her if he gave me any trouble. maybe she has an idea about how to snap him out of the spell. Kireth wants me to lead her to Raynor. She claims to have a method for freeing her brother from the spell. Now that Raynor has been freed from the Daedric spell, I should talk to him. Raynor Vanos asked me to find Lady Clarisse Laurent. He's worried about her and figures I have the best chance of resisting the entrapment spell. Lady Clarisse Laurent told me that Telenger the Artificer discovered something important, but she couldn't remember what it was. I need to find Telenger. Telenger's chamber is empty, but there's a note on the table. I should read the note and see what it says. Telenger the Artificer locked himself inside a vault on the lower level of the library in an attempt to slow the effects of the spell assaulting his mind. I should look for him there. I found Telenger the Artificer locked inside a vault on the library's lowest level. I should speak to him. Telenger the Artificer discovered a portal inside the library vault. There's something powerful and potentially useful on the other side. Telenger has unlocked the vault and asked me to join him inside. I entered the vault. I should talk to Telenger and see what he wants to do next. Telenger the Artificer doesn't trust himself due to the Daedric spell that continues to asault his mind. He wants me to enter the portal and find the source of the power he detected on the other side. I stepped through the library vault portal and find myself on a floating rock high above the Library of Dusk. I should investigate the area and find the source of the power Telenger detected. I came across a pedestal that holds a bright crystal of light. I think Telenger was right. I think that is one of the fabled Lights of Meridia. I obtained the Light of Meridia and need to get back to the surface. An image of King Laloriaran Dynar appeared before me and said that he will protect me if I choose to jump off the floating rock. 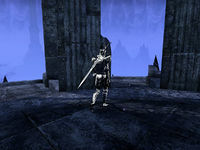 Finishes quest I returned from the floating rock with a Light of Meridia. I should speak with Telenger the Artificer at their camp outside the library ruins.